The Tabernacle wore a dress of paintings, collages and photographs, hung on a wire mesh, yesterday as it played host to artists of all ages entered in the 53rd annual All-Island Art Show. This show mixes the amateurs with the professionals, often paving the way for an artist to move from one status to the other. “Even the amateurs, if they sell here, which many of them want to, automatically become professionals,” said Lowell Roberts, who recruits and coordinates the judges for the annual show, an Island institution since 1958. Most of the work is professional, Mr. Roberts said. For Joan Apt, whose oil paintings of Vineyard scenes were hanging on the outside of the Tabernacle, this was her first All-Island Art Show. “If I sell something, maybe I can buy somebody else’s,” she laughed. The All-Island Art Show is open to any Vineyard artist over the age of 16 who is willing to part with an entry fee of $5 per piece. Artists may enter no more than five pieces, or one portfolio of no more than 30 pieces (not eligible for prizes). When registration finishes at 10 a.m., a clipboard-wielding group makes the rounds, peering intently at every piece. There are some prizes to give out, after all. The judges focus on different media, including photography and painting, before coming together to award the best in show. This year’s judges were Melissa Breese, Michael Hunter, Roberta Gross, Sheila Fane, Lanny McDowell and Jennifer Pillsworth. The best in show prize, and the $125 that goes with it, went to Katherine Thorstensen for her acrylic painting. Artists whose work goes down before the end of the show are disqualified from the competition, but sometimes the disqualification can be worth it, Mr. Roberts laughed as he related that one of this year’s prizewinners sold a painting to a customer who was running to catch a ferry. Selling the painting netted more money than the prize would have. There is also an award for Most Popular. Each audience member is allowed to purchase one star, at a cost of 10 cents, to affix to his or her favorite piece. This year’s crowd pleaser was Heather Capece, whose show of paintings and photographs at the West Tisbury Public Library, called Neverland, just ended. “There are always new artists showing,” Ms. Breese said of her experience judging the art show. The number of works entered can vary from year to year. “Not just the total number [varies], but the distribution among the categories. As you can see, this year we have a lot of blank space over in watercolor,” noted Mr. Robert. “There used to be many, many more oils,” Jeanne Wells, the chair of the All-Island Art Show, said of the way the art being displayed has changed over the years. Photography is now the biggest section. How did Ms. Wells get involved in the art show? “A good friend of mine about 30 years ago was the chair of it, and 20 years ago she had the poor grace to die and somebody had to be chair,” she laughed. “The idea was an opportunity for both professionals and amateurs to hang their works and to show their works to the public, and give the public a chance to interact with the artists and to sometimes buy and sometimes just admire. “And the artists have fun talking to each other and to the public,” Ms. Wells said. In the powerful August heat, Ms. Wells’ aim was accomplished as professionals and amateurs alike got their day in the sun. 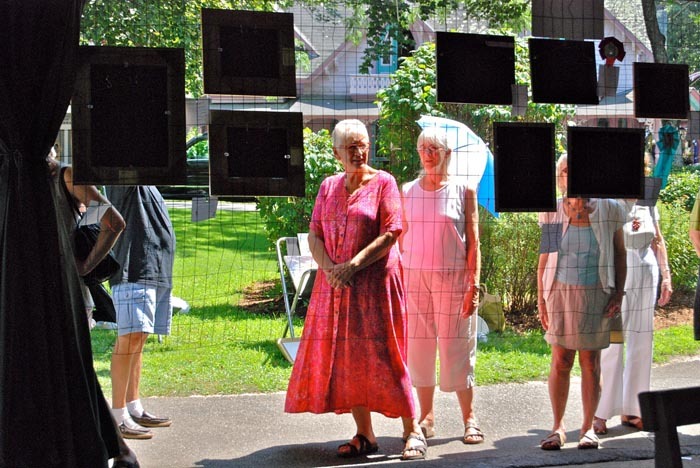 Participation in this year’s art show was down 15 per cent from last year, but the artists who did participate looked happy to be there as they smiled and chatted in their lawn chairs outside the Tabernacle. “It’s the only outdoor show that I would be interested in doing,” said Carol Campbell, who was showing oil and watercolor paintings at her third All-Island Art Show. “And, of course, it’s nice to interact with other artists and to see what other people are doing,” she added. As for selling work, it can be hit-or-miss. Ms. Campbell said her first year at the show was her best in terms of sales. Joining Ms. Thorstensten and Ms. Capece in the winner’s circle were: Paul Beebe and Kim Kimball, who each won the Old Sculpin Award; Christine Alesch and Gertrude Barden, who were awarded the Ruth Bogan Award; Phillippe Borde and Bill Brown won the Anne Culbert award; Michael Johnson received the Della Hardman award; and the Dragonfly Gallery Awards, one for painting and one for photography, went to Ray Prosser and L.A. Brown. For those who missed yesterday’s show and for youngsters with an artistic bent, the Junior All-Island Art Show takes place today in the Tabernacle from 10 a.m. to noon, with registration from 9 to 10 a.m. Entries are 50 cents a piece and each artist is limited to two entries.